I’m no soccer fan, I actually belong to that group of people that is only into soccer during the World Cup, however as I crossed to the headline of arstechina.com “The tech that’s putting women in EA’s FIFA games for the first time” it caught my attention; even in 21st century there are still many things going on for women “for the first time”. But first, lets’ talk about FIFA. As the author of Forbes pointed out in his article EA Sports’ FIFA Video Game Helps Fuel Interest in The World Cup: Credit Suisse forecasts unit sales of 11.3 million worldwide of FIFA 15 for the 12 months ending in March 2015. Sales of FIFA 16 are expected to hit 12.1 million. The game is the biggest annual release for $3.6 billion-in-sales Electronic Arts. 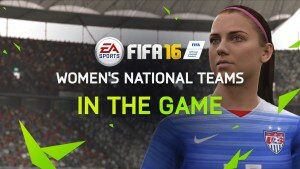 FIFA included 12 Women National Teams in the new version that will be out on September 22 for PlayStation 4, PlayStation 3, Xbox One and Xbox 360. Adding female players required more detailed animations in simple features, like moving hair, but more complex technologically speaking. FIFA developers started working. On Mashable “Four players from the U.S. Women’s National Team — Sydney Leroux, Abby Wambach, Alex Morgan and Megan Rapinoe — were fully motion captured in the studio to provide new run, walk and jog animations for the female players”. The technology applied for female players also resulted positive for making even more personalized the male players, like adapting different body shapes. Also on Mashable “Soccer Canada also visited the Vancouver studio to enter the 360-degree body scanning rig, which helped the team create references for new player models”. There are going to be represented Australia, Brazil, Canada, China, England, France, Germany, Italy, Mexico, Spain, Sweden and the United States. If FIFA is serious, this is just a start, since there are 142 Women National Teams. While in the real field “equal pay remains elusive, women’s soccer will soon be able to celebrate a different sort of victory—one that is small yet symbolic” in EA game says Michal Lev-Ram author in Fortune on July 2015. But why having women’s team becomes an issue of sexism? Scanning through gaming platforms it is easy to find all sorts of comments about female players in FIFA 16. What seems an obvious sexist comment from a female perspective, is somehow supported by many other people online. Sarah Banet Weiser says in her article comparing how we are better than in past situations regarding to sexim: But it is precisely technological access and a flourishing of a “public” culture of comments and feedback that makes this moment feel different-and feel differently worse than past moments. After the controversy of Gamergate in august 2014, where female game developer was threaten to death, several studies have pointed out behavior to sexim in the video game culture. “Although women are capable media managers, their continued status as “outsiders” deeply affects their gaming experiences and demonstrates a need for cultural change in online environments”. -Amanda C Cote. “Women and other marginalized groups need to be perceived as essential members of the gaming community, rather than outsiders, if they are to be empowered to stop harassment effectively, a change that will require help from both audiences and developers”. -Amanda C Cote. According to Big fish status database until March 2015 in the United States 22% of the video game workforce is made up of females and 76% of game developers are men. From #heforshe promoted by Emma Watson to women with hairy airmpit pictures on Instagram, this past year seemed to have an important impact in feminist movements. “That is, when feminism is in the air in the way it is in current culture, it is not surprising to find backlash from patriarchal culture. It is not surprising because opposition to feminism is not new: every time feminism gains traction in culture outside of what are routinely dismissed as niched feminist enclaves, it is received and positioned as a peril, which then invites a reaction”. -Sarah Banet Weiser. FIFA is not just a game, it is a brand set in people minds. Although, about the sexist comments FIFA has remain a passive voice without giving any posture on it. Is FIFA playing to “popular Feminism” ? Is this going to have an impact in female leagues and a younger audience? Are they assuming an important role in inclusion of gender or is it only a new feature? Bandenhausen, Kurt. “EA Sports’ FIFA Video Game Helps Fuel Interest In The World Cup.” Forbes. 2014. September 11, 2015. http://www.forbes.com/sites/kurtbadenhausen/2014/07/13/ea-sports-fifa-video-game-helps-fuel-interest-in-the-world-cup/. Nice post. I learn something more challenging on distinct blogs everyday. It will always be stimulating to read content off their writers and practice a little something from their store. I’d choose to use some with all the content in my small weblog whether you do not mind. Natually I’ll provide a link on your own internet weblog. Many thanks sharing.